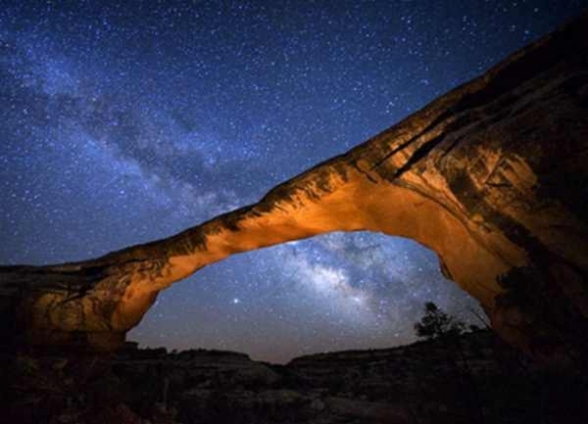 In 2006 the International Dark-skies Association designated a small park in Utah, Natural Bridges National Monument, as the world’s first International Dark-sky Park, thereby setting the bar incredibly high for those parks that wanted to follow suit. The skies above Natural Bridges are amongst the darkest in the USA. Once a source of wonder–and one half of the entire planet’s natural environment—the star-filled nights of just a few years ago are vanishing in a yellow haze. Human-produced light pollution not only mars our view of the stars; poor lighting threatens astronomy, disrupts ecosystems, affects human circadian rhythms, and wastes energy to the tune of $2.2 billion per year in the U.S. alone. Protecting the dark skies of Utah is one of my passions, we recently created a Colorado Plateau Chapter of the International Dark Sky Association which is holding it’s second annual Heritage Dark Sky Festival in Torrey this coming weekend. This entry was posted in Anthropocene, Dark Sky, Environment, National Parks, Forests and Monuments, Value of Wilderness on September 27, 2011 by Mark Bailey.